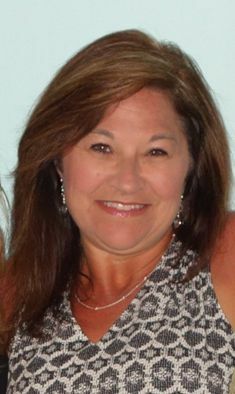 Lawrence, KS, January 10, 2019 – We are happy to announce that Angie Rexroad is joining the team at Snap Promotions. Rexroad will be focused on expanding Snap Promotions’ reach in Lawrence, Topeka, and the surrounding communities. Based out of Lawrence, Kansas, Snap Promotions was founded by Lawrence residents Lee and Kristin Eldridge in 2009. Snap Promotions specializes in custom printed promotional products, giveaways, decorated apparel and corporate gifts. Snap Promotions works with local, regional and national clients. Learn more about Snap Promotions at www.SnapPromotions.com. Angie Rexroad has lived in Lawrence since 1999. She was the owner and co-founder of Love Grub before selling it in 2018. Rexroad, along with her husband Gary, are committed to serving several local charities including Boys & Girls Club, Just Food and Habitat for Humanity. She also spent 11 years working in school district USD 497 with children with exceptionalities. Kristin Eldridge founded Snap Promotions in 2009 and has been in the promotional marketing industry since 2001. Eldridge is active with numerous organizations in Lawrence including PEO, Lawrence Rotary Club, Cottonwood, Lawrence Women’s Network, Toastmasters International and the Lawrence Chamber of Commerce. There are always new products available in the promotional products industry, but every couple years an item comes along and takes the promotional products industry by storm. This year will be the year of the Fidget Spinner. Every time we get a sample, one of our kids grabs it and proceeds to play with it for hours. Our manufacturers have been selling them as quickly as they can produce them. We’ve been hesitant to recommend them for projects because it’s been hit or miss if we could get them. They’re that hot. The good news is that production seems to have caught up with demand. We have several suppliers with plenty of stock. 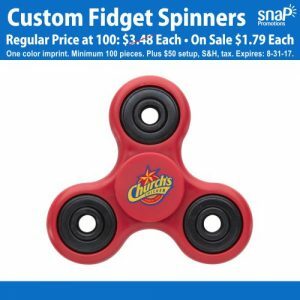 So if you want the current hot item, just let us know. We’re happy to help! Our poor blog! It has been ignored for longer that I care to admit. But it’s been a busy year. And as the year comes to a close, it’s a great time to look back at some of our most popular products. Tech-oriented products have been around for a long time, but every year new products are introduced into our industry. A couple of them have bubbled to the top of our list of most popular promotional gifts. Like many of our products, stands are available at a variety of price points. 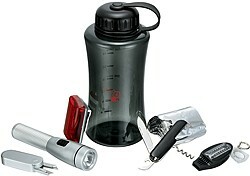 We have inexpensive giveaways as well as high-end corporate gifts. One of my favorites is the Ear Bud Splitter Phone Stand. 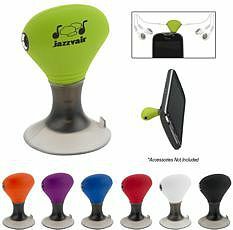 The suction cup easily attaches to the back of your phone or small device, allowing you to prop up your phone for easy viewing. Remove the suction cup cover and the stand transforms into a splitter for your ear buds. Now two people can listen at once. Very handy! If you’re looking for a nice gift, you should ask us about our SOLO Tablet Cases, a retail brand available to our industry. Do you get tired of trying to listen to music or watch a movie using the little internal speakers in your electronics? Me, too. Most cell phones and tablets have bluetooth capabilities. And we have bluetooth speakers that can be imprinted with your logo. If you have a select group of customers or employees, these make excellent gifts. The Solo Speaker is a rechargeable speaker that connects to your bluetooth enabled device within 10 meters of the speaker. Perfect for travelers, or in an office to deliver the music that your iPhone, iPad, Android OS device, or other Bluetooth enabled device is meant to. No more smudges! Clean your screen with a soft microfiber cloth. 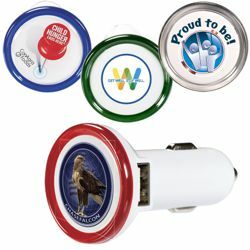 The Micro Buff and Micro Buff Mini are a great way to promote your brand with a tech-savvy gift. The Micro Buff utilizes re-positionable “Sticky Pad Technology” that allows it to grip tightly to the back of most gadgets. Leaves no sticky residue. Or if you prefer, instead of sticking the cloth to the back of your device, you can stick it to a reusable card for your purse or wallet. The cloth is printed in beautiful full color. Available in a variety of colors and styles, ear buds are inexpensive and useful. Travelers use them during flights and layovers to avoid disturbing others while watching movies. They’re great for runners, music lovers and people who work in quiet environments. And kids. Whew. I think my kids use them so they don’t have to listen to me sing along to their favorite songs. 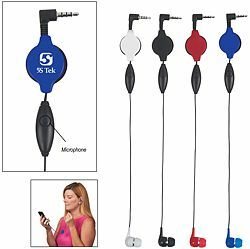 The Retractable Ear Bud with Microphone is available in several fun colors, and offers a nice imprint area for your logo. As these continue to come down in price, their popularity will continue to rise. Power banks allow you to give your electronic devices a quick charge when you might not have easy access to traditional charging sources. The Deluxe Traveler’s Mobile Charger is a portable lithium-ion battery in an ABS plastic shell. 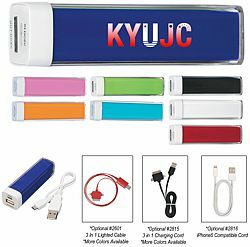 This power bank includes a standard USB connector cable to charge battery from your computer or any USB port with a power supply, and cotton strap with nickel-plated split key ring. Output capacity is 1000mA. Charging capacity: 100% for iPhone® & Smartphones; iPad®: 15% for iPad® 1, 2 and 3 – 20% for iPad® Mini; 100% for iPod® and digital music players. It’s not always convenient to carry a wallet or purse. 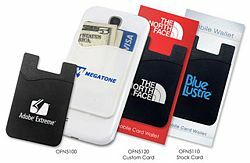 But if you want to travel light, a silicone wallet that attaches to your cell phone is a convenient way to carry your ID, money and credit cards. A Silicone Wallet with a re-positionable adhesive sticky back is a fun and functional giveaway. Available in a variety of colors and styles. The Roadrunner Silicone Wallet is available with a stock or custom card that gives this giveaway the feel of a retail product. Much like the Power Banks, USB Wall Chargers have become popular promotional gifts. Excellent for people on the go, travelers, or those who need a convenient way to charge their devices while at work. This Dual USB Wall Charger is a universal charger with two USB ports to simultaneously charge two phones, using your device’s USB cable. Output: 5V/1A/5W. The plug blades can be folded inside the charger for easy and convenient portability. And this product comes standard with a full color dome imprint. High-perceived value and a useful gift. Another great way to stop the smudges! At least some of them. As we transition from our old laptops to multi-functional tablets, Stylus Pens have become even more useful. Tablets like the Surface are utilizing touchscreen technologies across many applications. 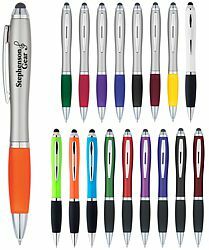 The Satin Stylus Pen is not only one of our favorite stylus pens, but one of our favorite promotional pens for under a dollar. Features a rubber grip for comfort and control, twist action mechanism for the pen, and a stylus on the the top. Available in a variety of popular colors! This year one of our most popular tech gifts gets knocked down a peg. USB Drives have long been not only our most popular tech gift, but one of our most popular corporate gifts across all product categories. I guess second place isn’t all that bad. 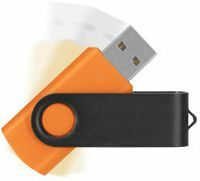 While USB Drives are available in many shapes and designs, our most popular drive is the Mix ‘n’ Match Swivel Drive. Features a capless design so you never lose your cap. Just swivel the clip and plug it into your computer. And you get to mix and match across a variety of clip and body colors. A great way to customize your drive to reflect your next promotion. And this year, our number one selling promotional technology gift is the USB Car Charger. When you select a USB Car Charger, make sure it charges the devices you need to charge. Not all are created equal. And not all chargers are intended to charge more demanding devices such is iPads and tablets. The Deluxe Round USB Car Charger is an excellent choice. Features dual ports and a LED ring that helps illuminate your logo in the dark. The white USB port is for all apple products such as iPod®, iPhone®, iPad®; and the black USB port is for Samsung®, HTC, Blackberry®, smart phones, and other devices. Take a look at these great specials on totes, acrylic cups, stainless steel tumblers and hand sanitizers! Special pricing ends February 28th, 2012. I’m full of pumpkin pie and glad to be working inside on this cold Kansas day. I’m not sure that I’m emotionally prepared for the holidays yet. Santa seems to have been busy the last few months filming dozens of commercials. I hope he’s had time to run the North Pole. I’ve been a good boy this year. With the holidays quickly approaching, it’s time to turn our attention to business gifts. If you haven’t ordered your corporate holiday gifts yet, there’s still time. If you’re needing gifts for your employees, clients or prospects, we’ve got some great ideas for you. And all of these items can be decorated and shipped in less than five working days. Made from 100% recycled cardboard, this promotional gift is both eco-friendly and affordable. 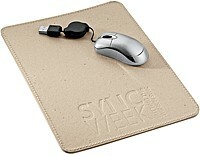 Features the universal recycling symbol debossed on the mousepad. Easy to mail or to include with other promotional materials. Can be debossed with your logo and company slogan. Order as few as 144 mousepads for $2.63 each plus setup charges and S&H. The USB mouse is not included, but we can do those too! This Bamboo Photo Frame is as handsome as it is useful. This will truly be an appreciated gift. 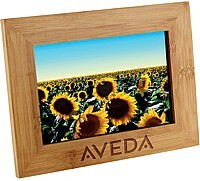 Bamboo is an easily renewable resource, making this frame another eco-friendly holiday item. Laser etched with your logo, this frame will proudly display your brand and a 4″ x 6″ photo. Includes easel stand for vertical or horizontal display. 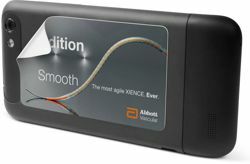 Order as few as 60 frames for $10.60 each plus setup charges and S&H. This L.E.D. light is the brightest and whitest available. Built to provide more than 23 hours of continuous light and years of intermittent light. Features a push-button switch and two lithium button cell batteries included (refillable). Available in blue or white. A useful promotional gift. I use my keychain light all the time! Order as few as 48 keychains for $2.23 each plus setup charges and S&H. This multi-piece set includes: 34-oz. bottle; 83″ x 51″ safety blanket; flashlight (2 AA batteries included); sewing kit (consisting of red, black, and white thread, 2 white buttons, 1 safety pin, and 2 needles); blinking safety light to attach to a belt or purse strap with on/off switch (2 AA batteries included); multi-function whistle with integrated thermometer (Fahrenheit and Celsius readings), compass, and magnifying glass; and pocket knife consisting of 1 large blade, can opener, flat head screwdriver, bottle opener, awl, corkscrew, tweezers, and tooth pick. Whew! Order as few as 48 gift sets for $18.57 each plus setup charges and S&H. Not that we would ever advocate drinking a bottled beverage or two, but many people seem to like to partake in this activity. Especially around the holidays. And when they do, they’ll need a bottle opener with your logo on it. This stainless steel bottle opener fits in a wallet credit card slot. A high-quality and durable giveaway, this bottle opener can be laser etched with your brand. Order as few as 288 bottle openers for $2.77 each plus setup charges and S&H. Made from factory certified 100% organic cotton, this eco-friendly tote features a large main compartment, and durable and soft cotton cording handles attached to the bag with grommet accents. Organic cotton farming techniques maintain soil fertility and reduce toxic pesticides and insecticides that pollute our air and water. This tote is approximately 15″ x 13″ x 4″. Order as few as 48 organic cotton totes for $8.60 each plus setup charges and S&H. This is just a start. Let us know a little about your corporate gift giving needs and we’d be happy to share some more ideas. Now is the time, whether you’re ready for the holidays or not! 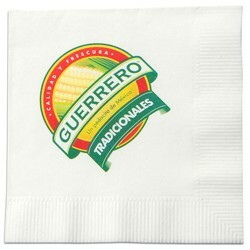 Over the years, one of the most difficult products to find for our clients has been napkins with a full color imprint. You typically have to order very large quantities, and often the print quality has been below our expectations. We had stopped offering full color napkins to our clients because we just couldn’t find a product we were proud to sell. But no more! We are excited to announce that we have found an excellent source for full color napkins. The print quality is very nice, and best of all, you can order as few as 100 of these custom printed napkins. Napkins are white, and available in all three traditional sizes: cocktail napkins, luncheon napkins and dinner napkins. Give us a call or email us for details! Today is the first day of fall, which means that Halloween is just around the corner. If your business is looking for some great Halloween bags to give out this month, we’ve got some excellent options for you. 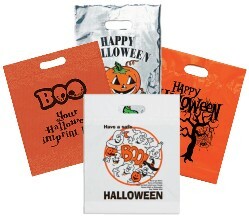 Available in both an orange and a white 2.5 mil plastic, these are our most popular Halloween bags. Available with stock artwork, safety tips and room for your logo. Made from 2.5 mil reflective silver plastic, these bags include die cut handles and a stock design that includes educational safety tips for trick-or-treaters. Plenty of room for your logo on the back. Our popular Halloween Die Cut Handle Bag is now available in 80 GSM non-woven polypropylene. These bags are durable and recyclable. Includes a recycled logo imprinted on both sides of bag. This is my personal favorite of all of our Halloween bags — the Orange Frosted Shopper. A smiling pumpkin greets young and old on this 3.0 mil plastic bag with black soft loop handles. Educational safety tips on opposite side of bag with space above to add your custom imprint. Most of our Halloween Bags feature stock artwork and allow room to imprint your custom logo. It’s time to get your boo on! With Memorial Day now behind us, it’s time to look for some great ideas for your summer promos. Below are just a few of our favorites for the summer of 2011! According to Green Your Way, Americans consume approximately 50 billion bottles of water per year, and the majority of these bottles head straight for a landfill. That’s a lot of waste. And in our minds, a wasted opportunity. Promoting your business with reusable water bottles is both eco-friendly and effective. 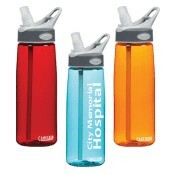 Many styles and materials exist for promotional water bottles, but our favorite is the CamelBak Water Bottle. These are BPA-free and made from Tritan Copolyester. CamelBak is a popular and trusted brand by camping enthusiasts. Imprinted with your logo, this is an item your clients will keep and use for years to come. For additional suggestions, we offer Nalgene Water Bottles, aluminum water bottles, stainless steel water bottles, and a broad assortment of BPA-free hard and soft plastic water bottles. Summer is an excellent time for travel, picnics and days at the beach or the lake. And it’s important to keep your food and beverages cold. Made by Koozie from 70D nylon, these high-quality insulated bags feature a front zippered pocket, watertight main compartment capable of holding 12 cans, and 1/4″ foam insulation. Available in green, black, red and blue. A useful item that offers repeat exposure to your logo and promotional message. 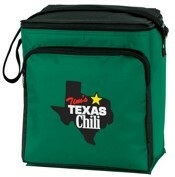 A great choice for outdoor events and company picnics would be a custom printed BBQ Set. Promotional BBQ Sets are available in dozens of styles, configurations and price points. This particular set includes a durable 300D polyester carry case with zippered closure, exterior storage pocket and 12″ webbing handles. 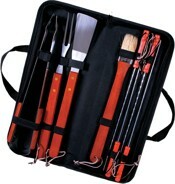 Set components made of stainless steel with hardwood handles and include spatula, fork, tongs, basting brush and four skewers. 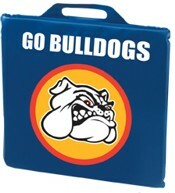 Your logo can be imprinted on the outside of the carrying case to make this an excellent promotional gift. Protecting your clients in the hot summer sun is always a great plan. We offer a variety of sun screen products, and our favorite is the Shady Sun Screen with Carabiner. Available with your choice of SPF15 or SPF30 sun screen, these promotional bottles are handy as they can clip directly to a golf bag, backpack or purse with the attached carabiner clip. Sun screen is water-resistant and sweat-resistant. Nothing says summer like a Mesh Beach Chair. 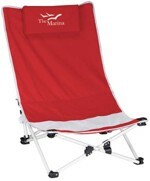 This low-slung beach chair is designed for complete comfort and relaxation. Includes a padded headrest, mesh insert in seat and 210D nylon carry bag with white strap and drawstring. The chair is made from powder coated steal and 600D polyester. Available in your choice of red, royal blue and khaki. 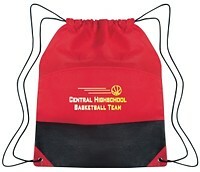 The headrest and carrying bag can be imprinted with your logo. Totes come in all shapes, sizes and colors. 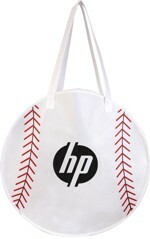 And now you can get a tote that looks like a baseball! This tote is 19″ diameter x 6″ deep, and made from durable 80 GSM nonwoven polypropylene. This is an eco-friendly product as well. The nonwoven polypropylene is 100% recyclable and made from 40% pre-consumer recycled product. Features 28″ handles. This would be a great gift at outdoor events, baseball tournaments, company picnics and festivals. Additional tote options include a variety of shopping and insulated totes made from nonwoven polypropylene, cotton canvas and polyester. Spring Sale! I’ve always enjoyed a good pun. And even a few that weren’t so good. 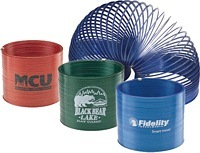 Coiled toys are fun promotional gifts, but nothing beats a Slinky. Here are a few key facts about our favorite toy that walks downstairs, alone and in pairs. 1. 94% of all Americans know Slinky. 3. Made from 90% recycled metal. 4. The Slinky can be color-keyed to match your product colors. 5. This Slinky is positively viewed by consumers, and has been around for more than 60 years. And in the month of April we’re offering 15% OFF the Slinky!